Urbanears' Plattan is probably the most iconic lifestyle headphone in the world, apart from Apple's earbuds and, arguably, Beats Solo. It's been around since 2009, since when it's actually been through numerous updates, from technical improvements to audio enhancements to, of course, seasonal colour changes to reflect current trends in fashion and interiors. Today saw the launch of only the third update to be given its own name (following the Plattan ADV and Plattan 2 in its wired form) and it's Urbanears' best headphone yet. Urbanears' sound is bassy, poppy and above all, warm. It's easy to make comparisons to Beats headphones – both are aimed at a style-conscious market and neither favours a transparent, audiophile-friendly sound. However, where Beats is brash, loud, NWA, American. Urbanears is quirky, warm, Abba, Scandinavian. It's hygge. It's Ikea meatballs. 'Plattan' even sounds like a coffee table from that store. 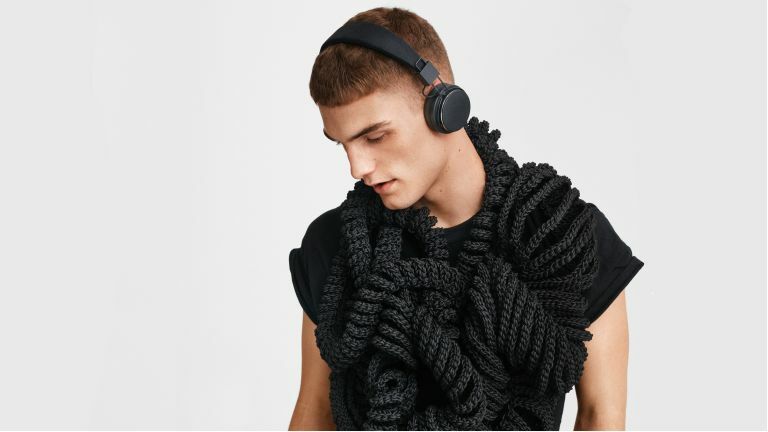 As an example of this playful quirkiness, the models in Urbanears' promotional pics that we've used here are dressed in rather architectural garments knitted from the fabric headphone cables used on Urbanears' wired versions of the Plattan. "There are audiophiles who are maybe 1% of the market who don't like that compressed, warm sound," says Oscar Axhede, Urbanears' black-clad brand evangelist. Yes. that is his actual job title. Granted, that doesn't mean that 99% of the world will love the sound of Plattan 2 Bluetooth but I'd say a good 50% will, and very few of the remainder are likely to be offended. Urbanears headphones are aimed at groovy young people, many of whom wear specs even when they don't need to. I know, right? It so happens I do need to wear specs, and on-ear headphones just do not sit well with them. On-ear headphones press the arms of glasses into the side of one's head, making long-term wear a chore. Urbanears Plattan 2 Bluetooth, however are incredibly light, with a highly flexible headband and cleverly engineered metal clasp, er… thing. You can wear them for hours and barely feel a thing. Says Calle Uggla, excellently named Chief Design Officer for Urbanears, "We are always taking feedback from users about Plattan. It's our icon." Urbanears tends to market its products on use cases rather than on the tech inside them. "Our users don't want to have to think about charging often," says Oscar. Well… now they don't. More time to concentrate on important stuff, like reading Vice and talking about Bake Off. And that. Calle promises we'll see some very different looking products from Urbanears over the next year or so – "We don't want to just sit still and get fat". But the Plattan, as the brand's flagship, for now retains the winning blend of tactile fabric, matt plastic, foam and wire that it's always had. The Plattan may look delicate but in its current incarnation it's "almost unbreakable" – disclaimer: I have not tested this claim – folds up to a size that'll just about fit in a hoodie pocket. The overall look echoes the kind of timeless style found in Dieter Rams' early designs for Braun or the best of Ikea's staples. On a more practical level, the stubby, earpiece-mounted joystick with which you switch tracks, change volume, pause and activate Siri (although not Google Assistant, for some reason) is among the best such controls I've encountered. There's no app, no noise cancelling – "Noise cancelling was just for German travelling men," says Oscar. "Sony now makes some amazing noise cancelling headphones, but we wait until we can find a way to make the technology work for us, and for the price to come down." "When the time is right, we will add noise cancelling," says Calle. In Plattan? "If you think of noise cancelling, it's for travel mainly, so perhaps in a headphone that reflects that…"
As a result, this hygge-phonic, wireless Scandi-design icon will only set you back £79/$99. Yes, Urbanears' famed Zound Plug is present and correct. No, I've never used it, either. I think again, it's for Millennials. They love sharing stuff.